As president, Donald Trump has the opportunity and the obligation to name about 4,000 people to fill political appointee slots — and more than 1,000 of those jobs require Senate confirmation. So far, he’s filled only a tiny fraction of them. Of the 549 positions the Partnership for Public Service and the Washington Post have identified as critical to a well-functioning administration, only 15 had been confirmed as of Monday. Another 18 have been named and are awaiting confirmation. Why is this the case? The consensus seems to be that the White House is in disarray, that Trump is in over his head, and that he’s micromanaging the process of naming subordinates by refusing to allow Cabinet secretaries to put their own teams in place. And it’s certainly true that Trump and his top advisers are still getting their sea legs, and coming to grips with the mammoth task of managing the federal bureaucracy. The Partnership for Public Service recommends that presidents fill the top 100 department and agency leadership positions shortly after the inauguration, and another 300 slots by August of their first year in office. Trump is falling well short of that standard. But other recent presidents don’t have much to brag about in this regard, either. President Obama didn’t have his top 60 lieutenants in place until nearly a year after his inauguration. George H.W. Bush didn’t fill all of his top slots until 242 days into his administration. Part of the reason is that getting appointees named and confirmed is a laborious process. But it’s also possible that Trump is deliberately slow-walking the process of building out an extensive management structure. Trump has never felt comfortable with having a large number of managers underneath him. 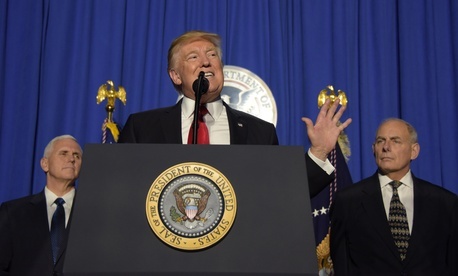 He “has kept a tight-knit set of advisers and decision-makers by his side throughout his career, with his children serving as his most-trusted confidantes,” Eric Katz reported in a piece on Trump’s management style for Government Executive last year. Trump’s company, despite his grandiose portrayals of a sprawling empire, always at base was a mom-and-pop entity, and what Trump managed throughout his lengthy professional career was principally a core group of barely more than a dozen executives housed on the 26th floor of Trump Tower. Until now. As president, Trump sits at the top of a massive bureaucracy not of his own making, a complex hierarchy designed to help him handle the most information-intensive, crisis-driven job in the world. He appears to be struggling to adapt. But it could be that Trump simply wants government to adapt to him. Leaving sub-Cabinet positions unfilled may be a deliberate effort to limit agencies’ power and strength. Trump wants to stop government action in a whole range of areas. So it may be a long time before he gets around to fleshing out his administration. And it may not make much difference when he names lower-level appointees — he’s probably filled all the jobs that have real influence already. Trump may also find that he gets more help from career bureaucrats to implement his agenda than he thinks. For all the talk of federal employee resistance to Trump, government workers on the whole see it as their duty to follow (legal) orders from elected officials and their appointees. They may not like what the president stands for, but it’s in their bureaucratic DNA to help him or her accomplish it. That’s why appointees in Republican administrations almost always leave office saying they expected bureaucratic resistance to their initiatives but were surprised at the level of cooperation. When I see a story about how Donald Trump didn’t fill hundreds and hundreds of jobs, in many cases we don’t want to fill those jobs. A lot of those jobs I don’t want to appoint because they’re unnecessary to have. We have so many people in government. Even me, I look at some of the jobs and it’s people over people over people. I say, “What do all these people do?” You don’t need all those jobs. Previous Post | Is President Trump Getting a Federal Paycheck?